In celebration of Canada Day I have collaborated with Field Roast to create an epic vegan poutine, because you can't get any more Canadian than that! Eh? This is a healthier version of traditional poutine, which is a Canadian dish made with French fries, cheese curds and topped with a light brown gravy. The Field Roast Creamy Original Chao Cheese and Smoked Apple Sage vegetarian grain meat sausage that I’ve used for this recipe contain zero animal products, so you can feel good about indulging in this dish because it is completely cruelty-free. For my Vegan Poutine Recipe I've used Field Roast Creamy Original Chao Cheese and Smoked Apple Sage vegetarian grain meat sausage. Photo by Love Wild Live Free. This recipe features homemade mushroom gravy that is delicious and simple to make. I’ve also got you covered with easy oven-baked fries (with an oil-free option), but you could totally use frozen fries if you want to save time. Epic Vegan Poutine with Field Roast Apple Sage Sausage, Creamy Chao Cheese + Mushroom Gravy. Photo by Love Wild Live Free. I have been a huge fan of field roast products for a number of years and I have been known to make the drive across the US border to pick up Field Roast products when they were not available in Canada. Field Roast is an independent and family-owned company, and the original maker of vegetarian grain meats. Their grain meats are made in small batches, using grains, vegetables, legumes and spices. What I like about field roast is that their products are not processed and are made with locally sourced, non-GMO ingredients. They are also high in protein, and contain zero trans-fats and cholesterol. Field Roast’s line of products includes traditionally made sausages, stuffed roasts, meatloaf, deli slices, cutlets, and an all American vegetarian frankfurter (my favourite on the market). Their newest product, Chao Slices, are a rich and creamy non-dairy coconut cheese made with Chao tofu, which is a fermented soybean curd that is popular throughout Asia. This past March, I connected with the amazing team behind Field Roast at The Natural Products Expo West in Anaheim, CA, where I attended the Field Roast party with all of the vegan “cool kids”. Dustin Harder aka The Vegan Roadie cooked up the best vegan taco bowls with Chao cheese sauce, crumbled Field Roast Sausage, nachos and all of the fixings. In celebration or Canada Day I have collaborated with Field Roast to create an epic vegan poutine, because you can't get any more Canadian than that! Eh? Photo by Love Wild Live Free. I have teamed up with Field Roast for an exciting Instagram Giveaway. You'll find all of the details below the recipe, so keep reading! 1. Wash potatoes thoroughly. You can peel the potatoes if you would like, but I prefer to leave the skin on. 2. Cut potatoes into evenly sized sticks. I used a countertop fry cutter for evenly cut fries and to save time. Optional: To make your fries extra crispy, place fries into a large bowl and fill with cold water. Soak for 1 to 2 hours. After soaking, rinse and pat dry. For this recipe I used compostable Parchment Baking Sheets from If You Care which come pre-cut and fit perfectly on my baking sheet. 3. When you are ready to bake the potatoes, preheat your oven to 400F. Line 2 large baking sheets with unbleached parchment paper. 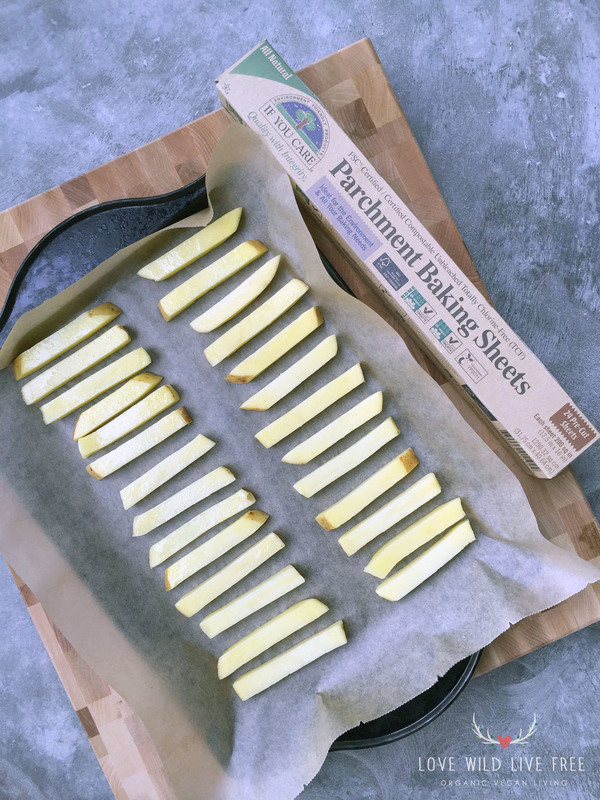 For this recipe I used compostable Parchment Baking Sheets from If You Care which come pre-cut and fit perfectly on my baking sheet. 4. Place the potatoes into a large mixing bowl and add oil (if you're using it) and salt. Toss to coat. Place the potatoes on to the baking sheets in an even layer. 5. Bake for 45 minutes, or until the fries are lightly golden and crispy. Remove from oven to toss/flip 2 or 3 times to ensure even baking. 1. Add vegan butter to a frying pan or saucepan and melt over medium heat. Sauté onion and garlic with a tiny pinch of salt for about 5 minutes. Stir often to ensure that the garlic does not burn. 2. Once the onions have softened, add the mushrooms and continue to cook for another 8 minutes. 3. Add nutritional yeast and flour, stir to evenly coat the mushrooms and onions. 4. Stir in vegetable stock and soy-free seasoning sauce or tamari. Continue to stir, breaking down any clumps. Allow gravy to cook on medium-low heat, until it thickens up, stirring often. You can add a couple of tablespoons of stock or water if you need to thin out the gravy. 5. Add fresh cracked pepper and more salt, if desired, to taste. Makes 2 cups of gravy. 1. Preheat your oven to 350 F. Line an oven-safe dish or baking sheet with unbleached parchment paper. For this recipe I used compostable Parchment Baking Sheets from If You Care. To save time on cleanup, I placed all of the fries onto one of the lined cookie sheets that I used for baking the fries. 2. Heat a small skillet over medium heat. Add oil and sauté crumbled sausage for 2 to 3 minutes, until lightly golden and heated through. Crumble the Field Roast sausage and keeping the slices stacked together, cut the Chao into cubes to mimic the size of cheese curds. 3. Remove 5 slices of Chao from the packaging. Keeping the slices stacked together, cut into approximately 24 squares. The goal is to mimic the size of a cheese curd so do not pull them apart. 4. Layer all of the ingredients on the baking dish/sheet starting with the french fries on the bottom. Add about 3/4 of the gravy, reserving the remainder for serving. Top with Chao and crumbled sausage. 5. Bake for about 20 minutes, or until the Chao cheese has softened, but not completely melted. 6. Add reserved gravy and garnish with green onions. I've teamed up with Field Roast for a special GIVEAWAY! Enter to WIN a Field Roast prize pack. This contest is open to US and Canadian residents and closes July 4th, 2016 at 8pm EST. To enter to win visit my Instagram post by clicking here. Don't forget to check out Field Roast on Instagram, Facebook, Twitter, YouTube and on FieldRoast.com. Allergy Warning: This recipe includes gluten and soy. If you have a soy sensitivity you can omit the cheese, this dish will still be delicious. This post was in collaboration with Field Roast and the products used in this recipe were kindly gifted for the development of this recipe. The parchment paper from If You Care and Zen Budda Buddery Spread from RawFoodz were also kindly gifted for recipe development. These are all unpaid endorsements. I only share products that I personally use and that are made with the highest integrity.